When you’re tight for space on your dining room server, pull out the additional serving space. Perfect for extra food prep or serving drinks, this is a great benefit to hosting dinner parties with friends and family. You don’t have to worry about creating water rings or nicks because you can easily hide it away when you’re finished using it. This sideboard is packed with style and features that make hosting in your dining room easier than ever. Felt bottom drawers to protect your favorite silverware, and a pull out serving service gives you the extra space you need when you have guests over. The Blue Mountain Transitional Sideboard with Pull Out Serving Service by AAmerica at Furniture Mart Colorado in the Denver, Northern Colorado, Fort Morgan, Sterling, CO area. Product availability may vary. Contact us for the most current availability on this product. 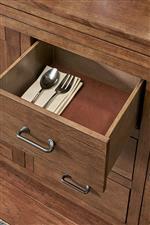 Storage Pull out serving tray, 3 drawers down the middle, and 2 doors with shelving. The Blue Mountain collection is a great option if you are looking for Transitional furniture in the Denver, Northern Colorado, Fort Morgan, Sterling, CO area. Browse other items in the Blue Mountain collection from Furniture Mart Colorado in the Denver, Northern Colorado, Fort Morgan, Sterling, CO area.